SERVPRO of Cape Girardeau & Scott Counties is your local trusted leader in the Fire & Water -- Cleanup & Restoration industry. With over a century -- and counting -- of combined experience, it makes us well-qualified to perform the fire, water, storm, mold, document recovery or cleaning job you need for your home or business. We are proud to be situated in the beautiful, vibrant Cape Girardeau community. We proudly serve the Cape Girardeau, Sikeston, Scott City, Charleston, Marble Hill, Jackson, Perryville, Chaffee, East Prairie and Benton, Missouri, communities for any fire damage, water damage, storm damage, mold remediation or commercial services. Speaking of storm damage, our heroes have helped rescue the day at a number of storm emergencies, such as Hurricane Katrina, Hurricane Harvey, Hurricane Florence and countless others. We know how to effectively and efficiently clean your residential or commercial property to restore it back to “Like it never even happened.” Our team of heroes has the training, equipment, and expertise to handle your restoration and cleaning needs. As a locally owned and operated business, we can provide 24-hour emergency service and are dedicated to responding immediately to commercial or residential needs. 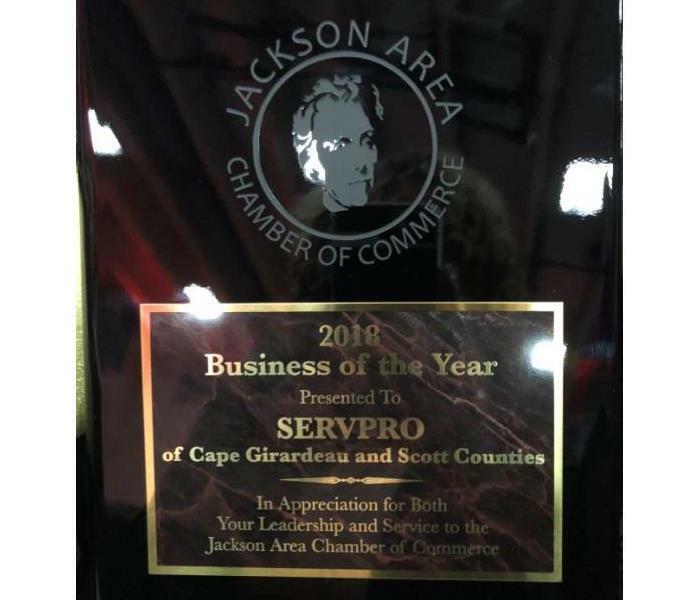 SERVPRO of Cape Girardeau & Scott Counties wins Business of the Year.